Boil pasta in water following box instructions and until cooked to your liking. Drain pasta and set aside. On a large sauté pan, cook chorizo cubes until the oils get released, about 10 minutes over medium heat. Add drained pasta to the pan with chorizo and stir until the pasta is covered and infused by the chorizo oils. 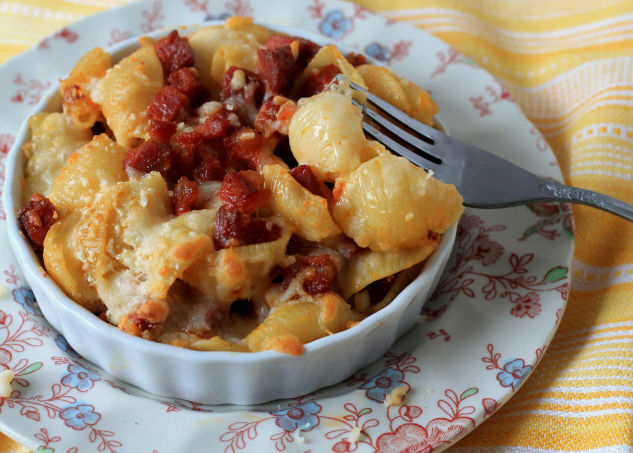 Place pasta and chorizo on a baking dish and cover with shredded cheese. Bake for 15 minutes or until cheese is bubbling, melted and golden brown. Serve and enjoy! For an extra cheesy dish, stir part of the cheese in the pasta and leave some to top it at the end. This pasta dish is perfect to serve large crowds. Everyone will love it as tons of cheese is added and the spicy and flavorful notes of the chorizo make it unique and so tasty. With only three ingredients, you can make this dish in no time. It can be prepared ahead of time and baked right before serving.